That’s the big question. Maybe, maybe not. I find the higher quality food, the less likely you are to need to add anything to it. Personally, even though I eat a pretty balanced diet, I still supplement with vitamins and other added nutrients to stay as healthy as I can. And I think the same is good for dogs. I’m talking about natural supplements here and given appropriately, they have no side effects so I think it’s worth experimenting with because the upside is a healthier dog that lives longer. Supplements are useful for a number of reasons, but there are three areas that they are especially beneficial. First is for dogs with allergies and/or sensitivities. If you have a dog with any allergies, adding a supplement can definitely help. I had a very itchy, allergic dog Pit Bull (Pits are prone to skin allergies) and adding some supplements helped her get rid of some of that. Supplements are also a good idea for older dogs. As dogs age, they need a little extra to help them grow old gracefully. Adding in some supplements can keep them living healthy and strong well into their senior years. And lastly, just being proactive and preventative so that things don’t escalate and you don’t have problems. 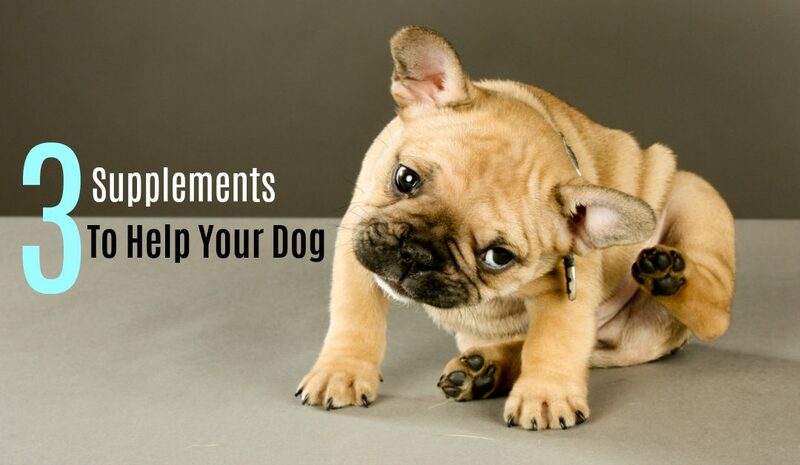 Sometimes it’s good just to add a couple of supplements so that your dog never has to encounter some of the common problems that can come up over time. So those are just some of the general reasons why you may want to supplement. I’ve add in supplements daily and think it’s one of the reasons my Pit Bull Hayley lived to 16 and why my new puppy is doing so well. Before we dig in to the 3 supplements I like best please understand that every dog and ever person is different. Start experimenting gradually and see what your results are. You can’t argue with results. Just start off nice and easy. Okay, here they are. My top 3 favorite supplements. I gave my last dog Hayley Omega 3 fatty acids for almost her entire life because it’s very beneficial for so many reasons—for both dogs and people. Although we humans, take both Omega 3 and Omega 6 fatty acids, for dogs they say it’s the Omega 3 are the only ones they can use. So what is it good for? Well, definitely it improves the coat and skin. If you have a dog with a lot of dander and stuff this can help minimize that it can make their coat look really good. It’s also great at reducing inflammation, for stuff like arthritis, allergies and inflammatory bowel disease. It also helps regulate the immune system and it can boost a dog that has a suppressed or overactive immune system. It can also aid in mental development of fetuses and puppies and improving cognitive function in older dogs. As well as lower blood pressure in the triglycerides, which is the bad fat and provides support for dogs with kidney disease, heart disease and cancer. Omega 3’s are your defense against all these major diseases that are cutting the lifespan of our dogs short. Again, why did I have a Pit Bull that lived to 16 when their lifespan is suppose to be 12 – 14? Could it be that I’ve been giving Omega 3 for her entire life? Could be. 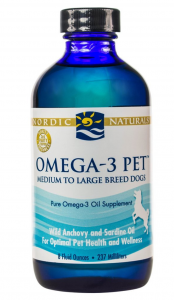 Omega 3’s come from a variety of sources but fish oil is probably the most common and preferred for dogs. I use a liquid from Nordic Naturals that is derived from anchovy and sardines. I just give a little squirt on top of each meal. Make sure you keep it refrigerated and shake it well before use. For healthy dogs you’re looking at 100 to 150mg per 10-pounds of body weight but just read the label of whatever product you buy. For dogs with some specific health problems it might be beneficial to experiment with a little hight dosage. Just keep in mind that this is fat, which contains added calories so you might have to adjust your dog’s diet accordingly (I didn’t take this into account and my dog gained some weight when I first started adding it in). These are digestive enzymes to help the ol’ tum-tum. Like Omega 3’s, probiotics are beneficial for a number of reasons. Number one, it aids in digestion. So if you have a dog that has some digestive upset, this is a great way to just help smooth things out a little bit. If your pooch has diarrhea, irritable bowels or intestinal inflammation it can improve the situation. 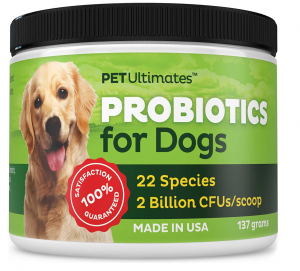 Also just like the fatty acids, probiotics will give a little boost to the immune system which will help prevent your dog from getting sick. It may even help prevent urinary tract infections which if ever had your dog had them it’s kind of annoying for us and pretty uncomfortable for your dog. So if your dog is prone to getting them, this is great to add in as a preventative. As as an added bonus, probiotics are also known to reduce some allergies. Most come in a powder form that you sprinkle on top of your dog’s food. I currently use one by Pet Ultimates with my new puppy which has been working nicely. I find probiotics very useful when you’re transitioning foods. Even if you’re doing a nice, slow switch over to the new food you can get some stomach upset and adding in some digestive enzymes can help your dog’s stomach get used to the new food. For dosages, it’s going to vary. Read the labels of whatever product you get and see how your dog does and adjust as needed. Coconut oil is good for whole slew of things. First off it can help with allergies—particularly skin allergies. It’s been know to greatly minimize many different kinds of hot spots and itchiness. it also makes your dog’s coat look pretty darn good—nice and sleek and glossy—and can help get through some of that dog smell (something my wife can’t stand). It can even prevent and treat yeast and fungal infections, which is something my old dog used to get a lot in between her paws and in her ears. Another cool benefit of coconut oil is that it even disinfects cuts and promotes wound healing when used topically, and it even can aid in digestion. Who knew coconuts were so great? So you can see there’s just a whole list of benefits here for coconut oil so it’s worth trying out. You can get basically anywhere and it doesn’t have to be specifically packaged for dogs. You’ll see the ingredient is just simply, “coconut oil.” So you can get a specific one marketed for dogs or just buy it in your local health food store. Any coconut oil will work. Now for dosages you have to be careful because you have to start out very, very slowly. You want to start with just a very tiny amount—just like a teaspoon per day in their food for small dog and puppies—maybe one full teaspoon for large dogs. But just a little bit. 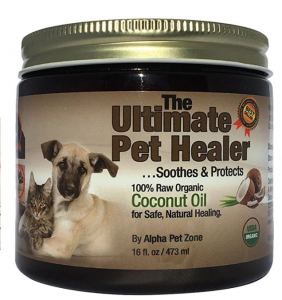 You need to start slowly because dogs can be a little sensitive to coconut oil and it may take them a little while for their bodies to adjust to it. Once you get through the acclimation dosage then you’re going to give about 1 teaspoon per 10 pounds of body weight daily or one tablespoon for thirty pounds and that’s per day. You can mix that throughout all their daily meals or just do it all in one meal. I would probably mix it and separate it in all meals and not give it all at once initially just to see how your dog responds to it. I love using these (and other) supplements because they are really beneficial in a lot of areas AND have no ugly side effects minus some stomach upset as your dog gets used to them. For that reason, I like to experiment with them for minor issues before heading over to my vet. 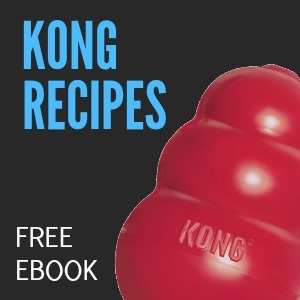 Often you can treat many things holistically without having to expose your dog to drugs. My previous dog, Hayley, was one of those dogs that if there’s a side effect, she’s was going to get it, so I had to be very conservative with medications and was always looking for holistic ways to treat things. It also tends to be a hell of a lot cheaper than paying for a vet visit and pouring money into expensive meds. Again, this is for minor issues. If your dog is seriously ill, I would get him to your vet asap. Always remember that the dosages will vary depending upon the brand of the individual supplement. I only gave you all the industry standards for a lot of the dosages, but make sure you read each individual label on the products you purchase. And remember to go nice and slow with dosages and let your dog get acclimated to see how they do. When adding in supplements it’s best to only add one new thing to your dog’s diet at a time. If you do too many things at once you won’t be able to determine what’s working or what’s causing any issues. Add in a single supplement for 3 to 4 weeks, then if all is well with your dog, start in on another one. Give these a try and see how they work. After you experiment with these and other supplements I think you’ll see that you can treat many thing naturally and keep your dog looking and feeling great, while extending their lifespan. Good stuff.